Can't believe it's been a week since I posted. I'm renovating again and finding it tough, as a single parent, to keep the house running and things organized with a two year old... not to mention the other four. This image from Kerrisdale Design (Karla is amazing check her blog) inspires me to create the order I'm craving. I have a friend helping with my little moth today. Oh my- I LOVE This image! I love overlapping lamps and wall hangings :) and you deserve a medal for going through a renovation right before the holiday season and with all of your sweet kiddos :) You are a supermom! I didnt know you were a single parent. I support you on this end. Keep holding on! Hang in there! You're doing great, better than you think I'm sure. and great pic, like the pics and the vase! Erica, so sweet of you to include one of my portfolio pictures! Hoping the reno goes quickly and smoothly....You are a fabulous mom and a fabulous designer, can't believe all you do - inspirational! 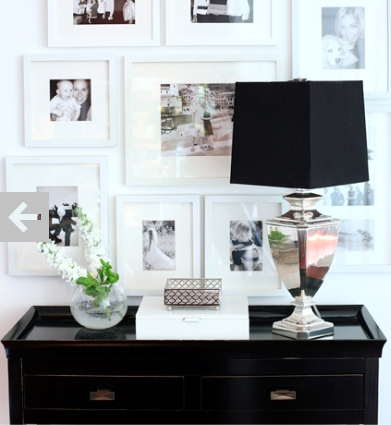 Since I love framed pics - having a collection of all white frames makes me swoon! I'm thinking of changing out my black ones! Loving the collage of pictures. So warm and welcoming! Great image and I will go visit here as well! Such boundless energy you have! Sometimes it is easier just not to stop, I reckon, or it all catches up with you. Good luck with your sanity and I am sure the renovation will be stunning like the rest of your house. Erica, so happy to have found your blog, I think I've been living under a rock somewhere!! I love your style, your blog is gorgeous.